The Toronto Blue Jays have avoided arbitration and signed eight players, including mainstays Marcus Stroman, Aaron Sanchez and Kevin Pillar, to one-year deals, the club announced Friday. 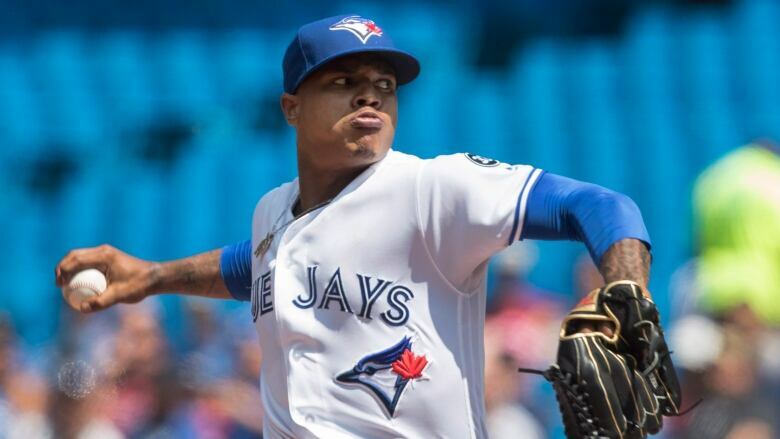 Stroman will make $7.4 million US in 2019 after posting a 4-9 record and a 5.54 earned-run average in 19 starts last season. The 27-year-old has gone to arbitration the past two off-seasons. In 2018, he received a bump from $3.4 million to $6.5 million, which was below his $6.9-million request. A year earlier, he beat the Blue Jays in arbitration and received a raise from $515,900. Sanchez agreed to terms on a $3.9-million deal after an injury-plagued campaign that saw him go 4-6 with a 4.89 ERA in 20 starts. The Jays also signed outfielders Kevin Pillar ($5.8 million) and Randal Grichuk ($5 million). Pillar hit .252 with 15 home runs and 59 RBIs in his sixth season with the club. Grichuk batted .245 with 25 homers and 61 RBIs. The team also announced one-year deals with right-handed relievers Joe Biagini ($900,000) and Ken Giles ($6.3 million), as well as infielders Devon Travis ($1.925 million) and Brandon Drury ($1.3 million). Giles, who was acquired through an in-season trade with the Houston Astros for fellow closer Roberto Osuna, finished with 26 saves and a 3.08 ERA. Right-handed reliever Ryan Tepera is Toronto's lone unsigned arbitration-eligible player.